Websahibi Review 2019: Is Websahibi a Good Hosting? I signed up to Websahibi, reviewed their unique features, tested how easy they are to use, checked with support on several issues, and tested the speed of the live site. When done, I tried to cancel my account and receive a refund. This is my experience with Websahibi - I hope you can learn from it. Websahibi is a Turkish hosting company which has been operating since 1999. As a company with a long track record, they have worked with more than 175,000 customers, and they were the first company to have a network of servers located in Istanbul, Ankara, Izmir, and elsewhere in Europe. Their support and website are available in Turkish. Websahibi sells a comprehensive range of hosting services, including Linux hosting, Windows hosting, reseller hosting, business hosting, dedicated server rental, plus domain registration and SSL certificates. Websahibi has servers located in data centers in Europe and the Turkish cities of Istanbul, Ankara, and Izmir. They offer a 99.999% uptime guarantee (not backed by SLA), and disk read times up to ten times faster than traditional hard disk drives due to the use of NVME SSDs. All their servers use Intel Xeon 5500 and 5600 processors, which are arguably the fastest processors in the world. Their packages are pretty comprehensive in terms of resources. All plans come with a one-click installer for hundreds of popular programs (e.g. WordPress, Drupal, Joomla, and ZenCart) as well as a website building tool. While they do support ASP, ASP.NET, Perl, CGI, and PHP (up to version 5), there appears to be no support for additional advanced coding languages such as Python and Ruby on Rails. Turkish customers (which may be most of them) will be pleased to know that Websahibi provides a Plesk control panel in Turkish as well as English. 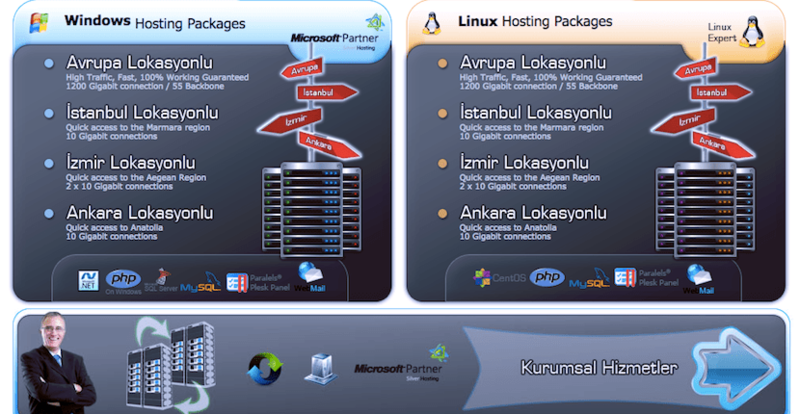 Websahibi offers five Linux shared hosting packages and five Windows shared hosting packages. The Linux packages include VIP Portal (monthly and yearly), Campaign, Standard, and Gold. The inclusions range from 100 MB web space and 5120 MB monthly traffic to 10,000 MB web space and 25,000 MB monthly traffic. Prices are pretty cheap across the board, and there is definitely a plan for every budget. Just be aware that many everyday users may need more resources than those offered in the cheapest packages, and both domain registration and SSL certificates cost extra. All plans are available on annual terms apart from the VIP Portal which can also be paid for monthly. When checking out, you might experience problems if you don’t speak Turkish, because the checkout pages don’t translate into English in your browser as well as the rest of their website does. Pre-sales support is available by telephone and email. Technical support has live chat (7 days), telephone and email options, and there is a client area that you can log into once you’ve become a customer. They also have FAQ and network status pages, but some of the tech support pages weren’t working when I visited. Websahibi has more than fifteen years of experience. They are now one of the leading Turkish providers, with more than 175,000 customers and four data center locations in Turkey and Europe. Check out Websahibi’s web hosting options today! Wondering how Websahibi stacks up against other Web Hosting companies? Enter any other Web Hosting company and we will give you a side-by-side comparison.